That is so Welsh -- I show you something fantastic, you find fault. Nigel's accent is a snapshot of a language in the process of speciation. "Sorry, what?" I find myself asking yet again. At least it's quiet enough to hear him at all; most of the volunteers have buggered off for the holidays, in here it's just been myself and Colleen and enough glam-rock that even I was beginning to weary of it before Nigel rang. From the sound of it on the other end of the line he's been similarly abandoned to work his way through his own chocolate-orange. "S'alrigh', keep it on da smoot', mun." Given that Nigel's family name is Cholmondeley-Fotheringhay-Smythe, I often suspect that he hasn't the faintest notion what he's on about either. One of the few work-experience students to come in today inserts herself into the doorway, scowling from under a blue fringe and several eyebrow piercings. "Somebody's in the front for Trevor," she announces. Colleen follows me out, I think as much to get a glimpse of my visitor as any true purpose to do with her armload of files. Jill is standing just inside the door from the vestibule, looking down the length of the old countertop with its henges of paperwork as if she's trying not to breathe for fear the entire construction will go down. "Hey, Bat," she says when she sees me. I hear a disgusted huff from the work-experience student as I stretch up to greet Jill with a kiss. "Why do trolls always get the hot girlfriends?" "Maybe because they don't go around calling people trolls," Colleen suggests, and then to me says with a shooing motion, "Go on, hon, scoot, I think we can keep the place together if you don't come back from lunch." I fetch my anorak and let Jill lead the way to a quiet-looking cafe nearby. She's amused by her reception at my office: Are there really trolls, do you suppose? Dunno. Jason might, he's been to Sweden. The restaurant is empty enough to suggest that it's not just our student-infested office that's short-staffed this week. For once it doesn't seem rude to linger, talking of preparations for the New Year's party that Jason has somehow cajoled Jill into hosting at her flat -- You own more chairs. After we've ordered a second round of coffees Jill pulls out her portfolio to show me her latest sketches. I'm still feeling no kinship with the images, but they're recognisably of one man, caught in moments ranging from reflective to, well, mostly reflective, though once or twice she's dared to depict me venturing the suggestion of a smile. Is this why all you Yanks ask me about straightening my teeth? I joke. And then between the pages I come to something with a burgundy cover, not quite the size of a quartered sheet of A4 -- "Jason put me in touch with someone called Max," she says as I open it with shaking fingers. I can only take it secondhand how convincing the likeness of me she's crafted is, but Max and his contacts will have seen to the technical details, numbers and files and assurances that a Trevor Davies exists to a degree that will satisfy many of the legal purposes I've been lacking. Max has always been thorough. It's just that one last step that's become such a moving target, in this brave suspicious new world. After I've sat speechless for too long a moment Jill lifts a hand to my cheek that comes away glittering with moisture. "I was sort of expecting more of an argument," she says. It's easier to lose myself in the details than to look at her. 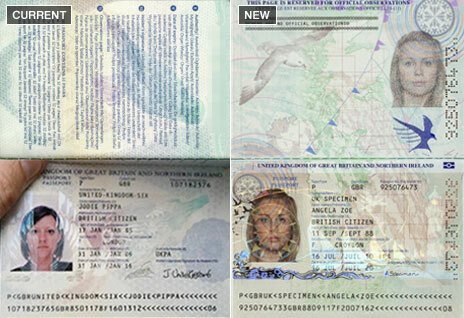 The passport is freshly issued in the latest security design, tern swooping over the white cliffs between the two ghostly reflections of my face. Trust Max to already have his sources. For place of birth it gives Abertawe, one more small reminder of how the world has changed out from under me; the jagged vowels of a language I'd been caned for using march across the title-page, subordinate to be sure but officially tolerated nonetheless. I turn again to the information printed round the photographs, the birth-date -- "Nineteen ninety-one?" "I think he wanted you to get as much use out of it as you can," Jill says, and I can see she's trying to hide a smile. "Happy nineteenth birthday, I guess." And how he'd not given the slightest hint about any of this when I'd seen him not four days ago I can't begin to imagine, even closemouthed as Max has to be about what he does. Forgiveness over permission, I suppose. "I'll do him for that," I say, shaking my head. That's the sweetest document forgery scene I've ever read. I turn again to the information printed round the photographs, the birth-date -- "Nineteen ninety-one?" Photographs plural? I liked this. Yup - my British passport only has one photo on it. Just like on that BBC news link.